HARRISBURG, N.C.– Galvan Electrical Products has updated its comprehensive technical specification for the ground rod electrodes, clamps and couplings it supplies to the electrical and utility markets. 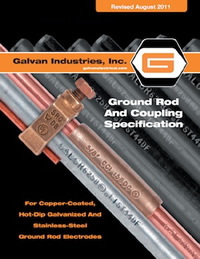 Available for easy download at Galvan’s website, www.galvanelectrical.com, the newly revised specification covers materials, production and use guidelines for the full line of Galvan copper-coated, stainless-steel and hot-dip galvanized ground rod electrodes and allied products. This strict, comprehensive specification has been developed and refined by Galvan's staff, which includes members of ASME, NSPE, IEEE, SCTE, IAEI, NFPA, NEMA, CANENA and the IEC. It includes references to respected standards agencies, including ANSI, ASTM, CSA, and UL. The specification provides complete information on product characteristics including materials, lengths, finished diameters, coating thicknesses, threads and markings. It also refers to Underwriters Laboratories specification on adhesion, bending and surface evaluation; as well as straightness, color-code identification and packaging. Included are details on threaded and threadless couplings as well as compression and bolted clamps. Galvan Industries is a major manufacturer of UL-Listed and CSA-Listed ground rods, including copper-coated, hot-dip galvanized, solid copper and solid stainless steel rods. The company also offers a full line grounding clamps, connectors, couplings and related products. Galvan was the first company to offer UL-Listed galvanized ground rods in full compliance with the NEC. The company is also the largest capacity contract galvanizer in the Southeast. For more information, contact Galvan Industries at 1-800-277-5678, Fax (704) 455-5215; e-mail: sales@galvanelectrical.com. Visit Galvan on the web at www.galvanelectrical.com.